Preparing Your Garage Door For The Summer | Overhead Garage Door, Inc.
With the cold winter months behind us and summer quickly approaching, it’s time to start preparing your garage door for the warm months. Most garage doors are built to last 15 to 20 years. But in order to maximize the use of your door, you will need to perform maintenance in summer to avoid any problems down the line. Chicago can get notoriously hot and humid in the summer, usually hitting between 78 and 92 degrees on a normal summer day. The humidity can make a garage extremely uncomfortable and could be dangerous to any combustible supplies that are stored inside the garage. Here are some tips on preparing your garage door for the summer. The inside of your garage door can get dirty due to dust and dirt, but the outer area of your garage door can also get dirty due to the elements and overall wear and tear. Start by washing the inside on your garage of any dust and dirt. Then use a hose on the outer door to rinse off any dirt before scrubbing it down with soap and water. To prevent dust build-up, you can add a thin layer of car wax to both sides of the door. Rotting can occur if your garage door is made out of wood, so consider adding a fresh coat of paint and applying a water sealant on both sides of the door to prevent further rot. If you have a steel door, rust can occur. If you spot any rust, simply sand it down and paint over it with a zinc primer. It’s important to check for signs of broken or bent hinges, ball bearings, rusty springs, wear or tear and other hardware that needs to be tightened in the summer. If your cables are frayed or worn out, replace them immediately by contacting Chicagoland Garage Door. Once you check your garage door parts for wear and tear, also check to see if they need to be lubricated. Moving parts (hinges, rollers, tracks), weather-stripping and the garage door opener’s tracks should all be lubricated. Avoid using oils like WD-40 and stick to using oils that are made specifically for garage doors. Also, make sure not to apply too much oil. Doing so can result in a build up of dirt and dust, which is something you don’t want to happen after a thorough cleaning of your garage. Always check the bolts at the back of the track to make sure none of them are loose. Doing so is not only a maintenance concern, but it helps ensure your safety. If any bolts are loose, it’s possible for your garage door to fall and damage your car or injure someone. In case a spring does break or you need one to be replaced, don’t do it yourself. Call in a professional garage door expert from Chicagoland Garage Door to do the job for you. Lastly, check the tensions of the springs by pulling the emergency release on the door while it’s closed. Once you pull on the release, lift the door as high as your waist. If the door closes, the springs need more tension. If it flies open, the springs need less tension. Make the necessary adjustments to keep the door open at waist height. Another important step in preparing your garage door for the summer is to properly line your garage with insulation that prevents heat transfer into the garage. You can also purchase a Clopay garage door that has polystyrene or Intellicore insulation that will block heat from coming in and prevent any cool air from escaping. You’d be surprised by how much insulation helps protect from the heat just as much as it does with colder weather. 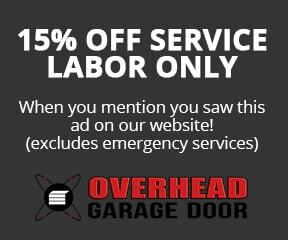 Overhead Garage Door, Inc. is a full service garage door repair and garage door installation company. We offer same day, 24-hour emergency service throughout the Chicagoland area. If you are in need of garage door installation and repair services, call 888-459-3720.